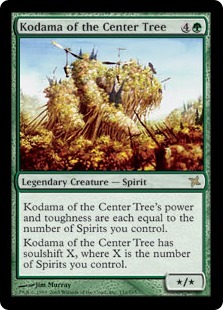 Card Text: Kodama of the Center Tree’s power and toughness are each equal to the number of Spirits you control. Kodama of the Center Tree has soulshift X, where X is the number of Spirits you control. Oracle Text: Kodama of the Center Tree’s power and toughness are each equal to the number of Spirits you control.